I picked up these two items while out at yard sales with my mom over Easter weekend. The water bath was just $3 and has a rack inside. 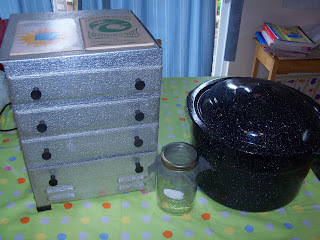 I recently discovered I can preserve fruit with a water bath and not have to use the pressure canner. Using a water bath takes much less energy and much less time so this was a big score for me. The other item is an old food dehydrator. It came with it's original manual (undated)that includes instructions for fruit leather and potpourri and a recipe pamphlet dated 1974. I'm looking forward to trying it out this summer, especially if I can find fruit super cheap again (last year I got peaches for about $.30/lb! ).